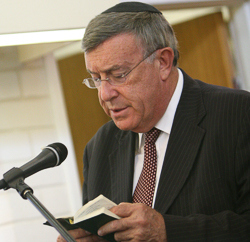 Interim President Rabbi Selwyn Franklin has issued an update on The New Organization of Rabbis of Australia (NORA). At a special meeting of the executive of ORA, I was installed as Interim President NORA Australasia. I have elicited the help of a cross section of Rabbis which led to the establishment of a Steering Committee consisting of Rabbis Paul Lewin, Chaim Ingram, Ian Goodhardt, Daniel Rabin, Yossie Friedman and Marcus Solomon. The steering committee will convene a conference in Melbourne in June 2015. Aside from inspirational sessions, the conference will deal with significant amendments to the constitution of the old ORA which was in the process of being incorporated. These amendments will focus on the moral standing of the organization and individual Rabbis. At the steering committee meeting it was decided to endorse Jacquie Seeman Charak as a special consultant to the steering committee. She will assist Rabbi Solomon in developing criteria for membership of NORA which will enable me to put these recommendations to Rabbis. We welcome ideas and suggestions from rabbis around the country regarding membership criteria. Once they have been developed, I will disseminate them to all Rabbis to seek broad based support. Participation in the conference – which will elect the incoming President and officers of NORA – will be granted to those who meet the newly established criteria for NORA membership. We need the unequivocal cooperation of synagogue leaderships to facilitate our success. I again call on Romy Leibler and COSA to unconditionally support NORA. At the conference we will call for nominations for the position of President of NORA and office bearers. I urge interested rabbis to consider serving the newly constituted Federal body to facilitate renewal of the Australian Rabbinate.